NORMAL/CLEAR DOGS CAN BE BRED TO ANY DOG AND WILL PRODUCE NO PUPS AFFECTED WITH THE PRCD FORM OF PRA. OUR DOGS; BONNI, DRAKE, GOOSE ARE HER DECENDANTS AND ARE THEREFORE NORMAL/CLEAR. Risk for developing prcd-PRA: This dog will never develop the prcd form of PRA (progressive rod-cone degeneration form of Progressive Retinal Atrophy). prcd-PRA is the most prevalent form of PRA in most breeds of dog but there are other forms of PRA that could occur in any breed. DNA testing does not replace the value of routine eye exams. Significance for breeding: Genetically Normal/Clear dogs can be bred to any dog and will produce no pups affected with the prcd form of PRA. 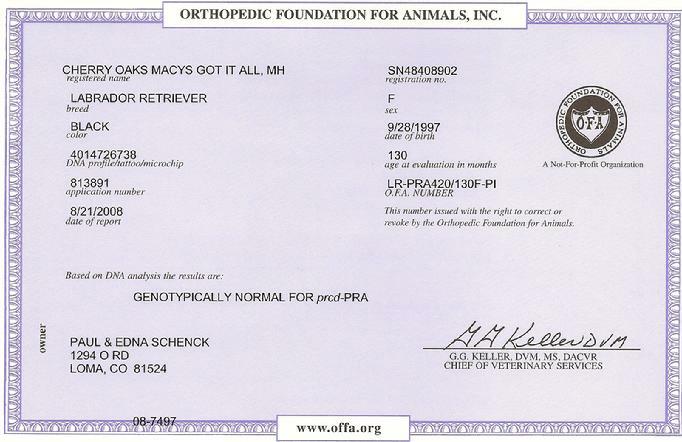 This interpretation is based on the test result of the DNA test for the specific mutation identified as causing the prcd form of PRA in Labrador Retrievers as of the date on this report. For further information, please consult the OptiGen website at www.optigen.com. Note: The use of this test is patent protected and licensed to OptiGen. See http://www.optigen.com/opt9_patent.html for details. I hereby certify that the sample submitted was of the animal described on this application. 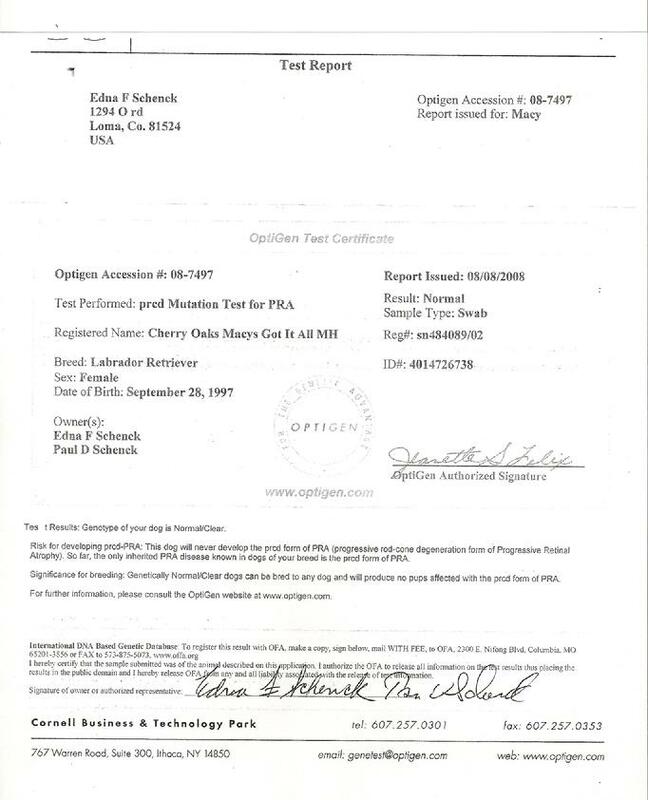 I authorize the OFA to release all information on the test results thus placing the results in the public domain and I hereby release OFA from any and all liability associated with the release of test information. BONNI, GOOSE'S MOTHER HAS TESTED PRA NORMAL/CLEAR.